Imbolc is the celebration of the first stirrings of spring after the dark days of winter. Ancient Pagans celebrated the holiday by lighting ritual fires to lure back the sun. One of the most popular customs among the Celts was to have a young woman, representing the maiden aspect of the goddess Brigid, enter the ritual area carrying a circle of lit candles. This circle is a symbol of the Wheel of the Year that Brigid is slowly turning toward spring. Thanks to their Norse brothers and sisters, the wheel was eventually worn on the young woman’s head. This tradition originated in the Norse celebration of Yule. If all this sounds familiar to my Christian readers, we have another connection with our Pagan friends! The Swedish folk song “Bring a Torch, Jeanette Isabella” commemorates the young woman in question. 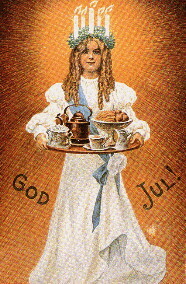 This custom is still practiced today in Scandinavian countries on St. Lucia’s Day, December 13th. Interestingly enough, St. Lucia’s original incarnation was Lucina, the Roman goddesss of light! A great book that helped me make some of these connections is Sabbats: A Witch’s Approach to Living the Old Ways by Edain McCoy. It is filled to interesting rites, crafts, activities and history that surrounds the eight sabbats observed by most modern Wiccans. This entry was posted in Brigid, Imbolc, Wheel of the Year, Yule and tagged Brigid, Imbolc, Spirituality, St. Lucia, Wicca. Bookmark the permalink.